8:15 p.m. CST. 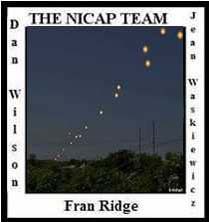 A witness by the name of Mr. Dino Laurenzi observed 5-6 yellowish-white glowing semi-circular shaped objects in a semi-circular formation almost straight up. The objects were heading to the east at high speed. After a few seconds the objects made a sharp turn left to a NW heading and gained altitude rapidly. As the objects disappeared they seemed to fuse or come together. No sound was heard from the objects. F-80 and F-86 aircraft were sent to the area to investigate. A Mr. Arthur Prchlik also sighted the objects.